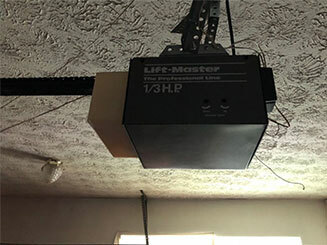 There are three main types of garage door openers and they each have different benefits and disadvantages. Understanding those is very important, in order to ensure that you find the right type of drive system for your home. Units of this type are tough and highly reliable. This is because of the durability of the metal chain they use. At the same time, however, its that chain that makes models of this type noisier than their counterparts. Generally, you can reduce the noise level with proper lubrication maintenance, but only to a certain extent. Another main benefit is that these units also tend to be more affordable than opener models that use the other types. Devices that use this type of drive system work the same way the chain drive ones do. The difference comes from the steel-reinforced or rubber belt which replaces the metal chain. Belt drive models are the quietest of the three types, and they are an excellent choice for homeowners who have an attached garage. Their main downside is their price, as they tend to be more expensive than the other two types. Screw drive models have fewer hardware components compared to their chain and belt drive counterparts and this significantly reduces their risk of failure. They have a high door opening speed and this makes them very convenient to use. In terms of noise level, they fall between their two “rivals”. Screw drive units have been known to have operation difficulties resulting from large temperature fluctuations, but as their technology has improved, such issues are becoming somewhat rare. Don't expect to find considerable differences between openers of the same type manufactured by different brands. The differences come mainly from the extra features and accessories which we’ll focus on right now. You would definitely want to get a garage door opener with a technology which allows for reliable signal transmission between the remote controls and the receiver. The two- and three-frequency technologies work very well to give you just that. Rolling code technology, which changes the access code automatically after each opening of the door, is essential for keeping the level of security high. The safety sensors must be included in the package. From then on, it is up to you to decide on the number and types of remotes you want to use. The mini ones are easier to keep secure with you at all times. You can also get a wireless keypad which will enable you to get inside the garage without the use of a remote, or an opener with smartphone connectivity, which can be operated with the use of our your iPhone or Android device. For more advice and information, call our team at Garage Door Repair Norwalk. We can take care of the opener installation for you, and provide you with all the information you need to make an informed decision.